Buy Hness 100% Pure Whey Energy Protein Supplement Powder with Vitamins & Minerals, 1 kg / 2.2 lb (Chocolate) at Rs 999 only on Amazon. If you are a weight training athletes and active fitness enthusiasts, it’s a must have product for you. Hurry!!! Order now before the price goes up. 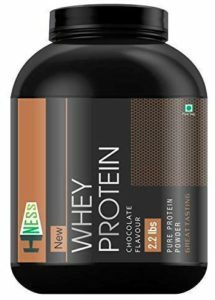 How to Buy Hness 100% Pure Whey Energy Protein Supplement Powder with Vitamins & Minerals, 1 kg / 2.2 lb (Chocolate) at Rs 999 only?